If you don’t know what Biblical Theology is, buy this book. If you do know what Biblical Theology is, buy this book. If you read the bible buy this book, if you don’t read the bible, then shame on you 8) . This book serves as a mini commentary, has helpful articles on biblical theology and is a dictionary that follows themes (such as the Temple/Tabernacle or High Priest) in the overall story of the bible. That story being the redemption of mankind through the sovereign hand of God. The articles alone are worth the price of the book and when you add what the book was actually published to accomplish you have just robbed the contributors. I don’t want to get into biblical interpretation here. However, I have to say, the majority of churches that meet on a weekly basis rob their congregants because of a lack of biblical theology. That is why proof texting, topical sermons that never point to Christ and His redeeming work throughout history and the “what does this mean to me” syndrome is causing, in the name of one author, “a famine in the land”. Whenever we interpret the bible in the way the Holy Spirit never intended we “deinspire” the bible and it becomes as supernatural as any other piece of literature we find in our local bookstores. I think this book will help you get a grip on biblical theology, its contribution to biblical interpretation and help you read your bible as an overarching story of God’s redeeming work in HIS-story. Buy this book read it and let me know what you think. Anthony Carter, Ken Jones and Michael Leach are all pastors. Anthony Carter pastors East Point Church in East Point (Atlanta) Georgia, Ken Jones pastors Greater Union Baptist Church and Michael Leach pastors All Saints Redeemer Church located in Decatur (Atlanta) Georgia. 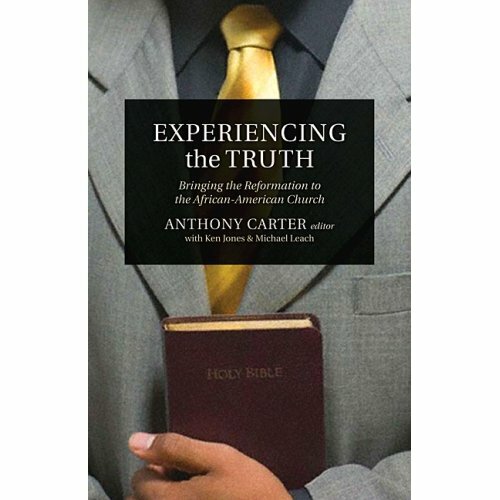 Anthony Carter also published another ground breaking work titled “On Being Black and Reformed”. The purpose of the book can be easily indentified in the sub-title “Bringing the Reformation to the African American Church”. The authors feel that if the Gospel is going to advance amongst those of the African American community it is imperative that the current practice be reformed. The authors go through and clearly explain exactly what this means (Biblical Theology Chapters 1-2) and what it should look like (Chapters 3-5). Anthony Carter sums the book up with an appeal for the Doctrines of Grace to be embraced amongst those of the African American community and the book ends with an appendix pack full of very practical ways to flush out a Reformed Worship Service.